I want to stay with slingshot for fibre but i cant???? whos in bed with who?? Forums › Slingshot and CallPlus › I want to stay with slingshot for fibre but i cant???? whos in bed with who?? This is what i think i Know.....So I am in central city Tauranga where UFB (ultra fast fibre from Wel Group in Hmailton) have laid the fibre in Tauranga. UFB are in bed with truspower and some other local isp's. So can I only go with the people who are in bed with the guys that lay the fibre? it makes no sense whatsover to me? Why cant Slingshot sign me up. Arent all these fibre layers Chorus and UFB just contracted to the GOVT to lay the damm stuff? Also very consfusing when truspower have all over their website Ultra Fast Broadband when they mean fibre. I know the difference newteen dsl and fibre but the companies are mixing the terms together. Maybe someone with more knowledge than me can advise me on what to do. I want fibre but would liek to stay with Slingshot to keep the wife happy etc. That's not really how it works. The government's funding the build but doesn't own it. The infrastructure belongs to the LFCs (Local Fibre Companies) of which Chorus is one, and Ultra Fast Fibre is one. RSPs (Retail Service Providers) such as us, Slingshot, Telecom, Snap etc, then rent service from the LFCs and sell it to you, the customer, alongside Internet access and whatever other services we want to deliver across it. So nobody's "in bed with" anyone, it's simply a case of Slingshot might not have built the agreements and/or infrastructure to service your area yet. It may even be that although the fibre is laid, UFF haven't put the rest of the infrastructure in place yet. 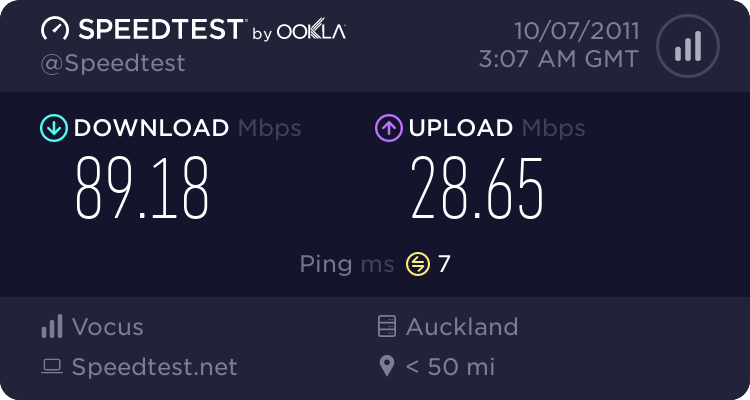 Slingshot are not listed as an RSP for Ultrafast in Tauranga. Ask Slingshot on Twitter or Facebook if an agreement is coming soon for Tauranga / UltraFastFibre UFB. Also very consfusing when truspower have all over their website Ultra Fast Broadband when they mean fibre. Ultra Fast Broadband = fibre. That's where the project gets it's UFB acronym from. Ultrafast Fibre (UFF) are LFC's (Local fibre company) of Fibre through the government UFB Ultra fast broadband program through Crown Fibre Holdings. There are even more steps in that when you get into contractors and subcontractors but I dare not touch that. Crown Fibre Holdings (Goverment) funds the build of the network. CFH have contracted Chorus, Ultra Fast Fibre and Transfield to build the network. These 3 contractors can sub out the work to anyone they want to aid in building the network. After the network is built it is up to individual ISP's (like Slingshot) to get connections in to the network so they can service the end customers. So in summary, no one is in bed with anyone. It is up to individual ISPs to decide which areas in the country they want to service. chevrolux: Crown Fibre Holdings (Goverment) funds the build of the network. Oh and ISP's in this setting are referred to as RSP's (Retail service providers). yep they are but was keeping it super simple for clarity. There are so many acronyms being thrown around it gets a bit crazy some times. Hi, Slingshot's releasing capability for Chorus's UFB (auckland area) this week. Can't give you any dates on other regions sorry. And the other thing to include is that it is also up to the ISP to provide service in your area. Since all fibre companies have handover area's so as when you look on the UFF site only some ISPs are doing some areas. It's not mandatory that an ISP provides service in your area if they choose not to. Plumbing in handovers isn't cheap. I believe Telecom will be going live shortly with UFF service as I know there is a trial currently happening and you can sign up to get contacted when it goes live if you are interested. Good to see a heap of ISPs available now. You have lots of choice!